Travel back in time, along the paths of early Arctic explorers on this iconic cruise expedition. As you travel along the Northwest Passage, explore the spectacular fjords and bays, view rare Arctic wildlife, and see other-wordly ice formations in Greenland. Travel back in time as you explore the history of the Northwest Passage. Learn about the ill-fated Franklin Expedition from 1845. Your crew may have even assisted with the expedition team that discovered the sunken Franklin vessel in 2014. With polar bears roaming the shores and walruses rolling around on ice floes, you’ll want to keep your camera close at hand. A resident photographer onboard the ship can assist and provide tips to make sure you get the best shot. Join a hiking excursion along the shore – from an easy walk to a hearty climb, there are options to suit everyone onboard. If you are up for a real adventure, add a daily small group kayaking program for the length of your journey. Depart Edmonton on a charter flight to Cambridge Bay, a remote outpost above the Arctic Circle. Located on the southern shores of Victoria Island. The RCGS Resolute is an ideal platform for exploring the Canadian Arctic. Although the vessel can hold up to 146 guests, activities and excursions are broken into small groups so its easy to find a special interest that suits you. Upon arrival in Cambridge Bay, enjoy a walking tour of the town and board your expedition ship in the afternoon. After settling in to your cabins and exploring the ship, you’ll meet your expedition team and fellow passengers. Excitement is in the air as you enjoy a welcome cocktail and cast off, bound for the fabled Northwest Passage. This purpose-built polar expedition vessel is designed for comfort, and is well-appointed, safe, and ice-strengthened. Features include bar/ lounge areas and modern dining rooms with 180-degree views from the large picture windows, a gift shop, a library, a wellness center including a gym, Jacuzzi, sauna and steam room, and salt water pool. Your Shackleton Suite features the option for either a queen or two single beds, with upgraded linen and pillows, and a private washroom with shower. In your lounge area you have a sectional sofa, a desk and chair, floor to ceiling cabinetry, and a flat screen entertainment system. Your suite is well-placed for easy access to the bistro, outdoor observation spaces, and ship's bridge. As the ship charts a course into the Northwest Passage, The Captain aims to visit Victory Point, travelling very near the location of the wreck of HMS Erebus, one of the lost ships of the doomed Franklin Expedition of 1845. As we chart a course into the Northwest Passage, our onboard presentation series begins, and the legend of Sir John Franklin and his ‘lost expedition’ is beginning to unravel. The Academic Sergey Vavilov and her team were part of the expedition which discovered the sunken Franklin vessels, so make sure to take advantage of the onboard presentations. The second ship, the HMS Terror, has just been discovered. This morning the ship arrives at Coningham Bay on the shore of Prince of Wales Island. Today you arrive at one of the most remarkable wildlife sites in the Arctic – Coningham Bay. Here you’ll see polar bears feeding on Beluga whales, and it is not unusual to find the shoreline littered with whale skeletons and well-fed looking bears! Today the ship transits the narrow passage of Bellot Strait – a channel separating northerly Somerset Island from continental North America. As you pass through the strait, keep your eyes peeled for harp seals, bearded seals and even polar bears. In addition you’ll visit the historic site of Fort Ross, a former Hudson's Bay Co. fur trading outpost, located at the southern end of Somerset Island. Archaeological sites nearby reveal the centuries of habitation by the Inuit people, and their predecessors. Step back in time today and learn about the history of Beechy Island. This is a thrilling location for history buffs and for many it will be the defining moment of your expedition. Beechey Island holds a special place in Arctic history. It is here that Sir John Franklin’s ill-fated expedition spent its last 'comfortable' winter, before disappearing into the icy vastness. A trip ashore at Beechey Island to visit the grave markers is haunting, as you imagine the struggle for Franklin’s team to survive in the harsh Arctic winter. You are now at almost 75° degrees north of latitude. Cruising the coastline of Devon Island, you are now in the waters of Lancaster Sound. You are now in the waters of Lancaster Sound – a rich, bio-diverse region often referred to as the wildlife ‘super highway’ of the Arctic. These massive volumes of water from Baffin Bay, Beaufort Sea, and from the archipelago of islands to the north, combine to make a rich cocktail of nutrients supporting the Arctic wildlife. An old RCMP outpost makes for unique photographs against the stunning landscape, and Muskox and Arctic Hare may be seen as you hike the area. You sight the wild north coast of Baffin Island and navigate through Navy Board Inlet. The vast landscapes of Sirmilik National Park surround you as we approach the remote Inuit community of Mittimatalik. Today you visit the remote Inuit community of Mittimatalik (Pond Inlet). A highlight will be a visit to the Natinnak Centre and meeting the local Inuit people. Learn about the daily life, culture and history of the people of the north. 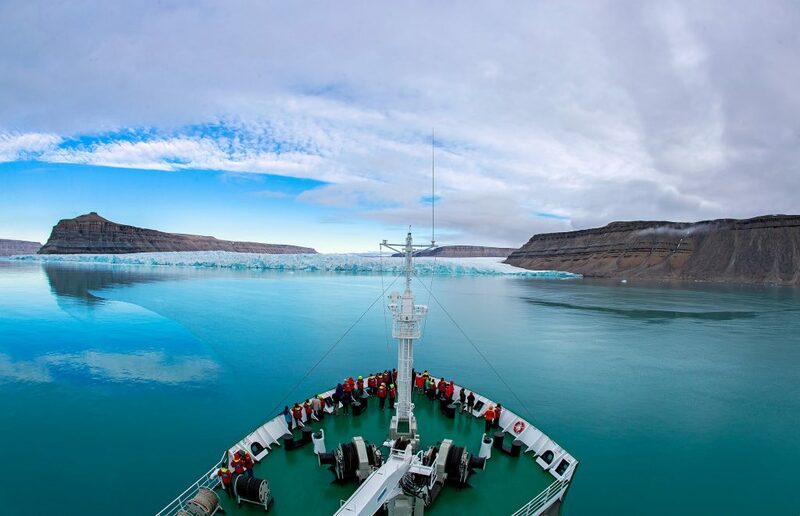 This morning you enter the North East corner of Baffin Island and navigate into the spectacular Gibbs Fjord. Your expedition ship will seem dwarfed by the giant peaks and snowy glaciers as you cruise slowly along the dark waters. As you sail through Gibbs Fjord located on the south side of Sillem Island, you will be taken in by the breathtaking beauty surrounding you. Dating back almost 2 billion years, the rocky cliffs, some standing at over 1.2 meters high, offers a wild landscape like no other. The area has been known as a home for bird colonies, polar bears and the Inuit people. Today you cross Baffin Bay making your way to Greenland. Keep watch for fulmars and dovekies, pilot whales and perhaps even orca. As you cross Baffin Bay today, your team of onboard experts will continue to educate you on the history and wildlife of the Arctic. As the ship approaches Greenland, the likelihood increases of spotting some of the big baleen whale species. Today cruise into one of the wonders of the world, the Jacobshavn Icefjord – a UNESCO World Heritage site. The glacier that creates these stunning icebergs advances at over 40 metres per day, creating around 50 cubic kilometres of ice each year. The approach to Ilulissat is dependent on the amount of ice in and around the mouth of the fjord. Your Captain and officers are skilled ice navigators and the ship has one of the highest ice ratings of any vessel exploring Arctic waters. Today explore more of the fjord, before visiting the beautiful town of Sisimiut. See one of the world’s longest fjords, Sondre Stromfjord, tower above the ship, as you sail up it today. Venture out by zodiac to explore the side fjords with your guides on foot or by kayak. Here you may see Muscox on-shore, and the white-tailed sea eagle soaring above you. This is a great day for hiking. This evening, enjoy a celebratory dinner, attended by the Captain of the ship and reflect on the epic voyage. Today your expedition cruise comes to an end. Disembark the ship via zodiac in Kangerlussuaq and make your way with your group to the airport for your chartered flight to Ottawa. A transfer will take you to your hotel in Ottawa. Check out of your hotel, and make your way independently to the Ottawa airport, or as us about adding time Ottawa, or perhaps taking the train to explore Quebec. Your Twin Private Cabin features a large picture window, private washroom, and the option for either a queen or two single configured beds. There is a comfortable lounge with writing desk and chair, ample storage, and flat-screen entertainment system. This spacious cabin provides easy access to the main dining room on the ship as well as the gift shop. Kayaking program at an extra cost at US$695 per person (if you wish to participate please let us know at time of booking as there is limited space). Transportation between Edmonton airport and hotel for arrival and departure in Canada.